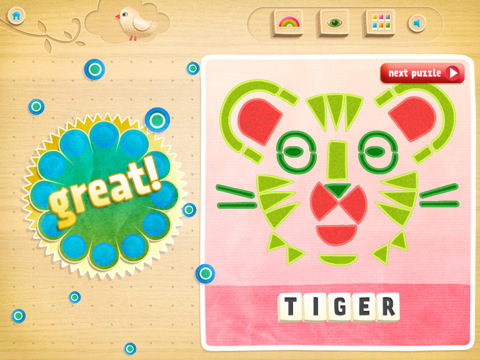 If you think the educational component of pre-school apps is a little lightweight, Shape-O! will make you reconsider. Shape-O! 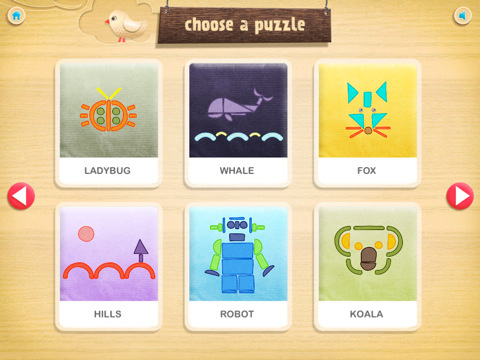 is an iPad app for pre-schoolers that integrates more than one hundred geometric puzzles with learning about shapes, words, colors and sounds. Piece together the different shapes to form images including animals, plants, landscapes, transportation, faces and foods. If you have ever watched a child totally absorbed in a puzzle, trying pieces this way and that, you will immediately see why Shape-O! will appeal. I love watching my kids do puzzles – you can almost hear the cogs turning as they pick up each piece and assess where it might go. Shape-O! is slightly more abstract than a traditional picture puzzle and for that reason it’s challenging and interesting. It reminds me of the Miller Goodman ShapeMaker blocks that we reviewed here two years ago. 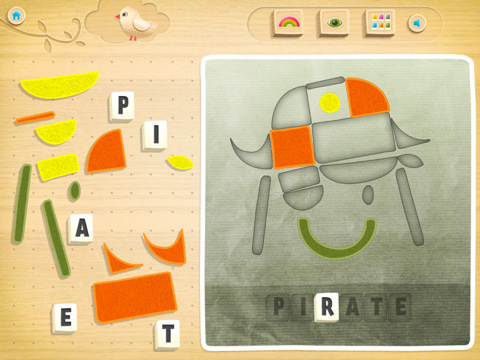 A lot of thought has gone into the small details of this app and the result is fantastic – the use of real instrumental sounds (as opposed to ‘electronica’), changeable colour palettes (because sometimes you’re in a yellow kind of mood and sometimes a blue) and a setting to allow parents to choose the level of difficulty. Shape-O! is available from the iTunes store for $2.49.